Action: Hartlepool United v Wrexham. Wrexham suffered a major blow to their promotion hopes by crashing to defeat against Hartlepool United at the Super 6 Stadium. It was a bad day for the Dragons, but Vanarama National League leaders Orient were delighted. They won 2-1 against Telford United in their FA Trophy semi-final to complete a 3-1 aggregate victory, while both of their closest rivals in the battle to go up lost. Wrexham crashed at Hartlepool, while second-placed Solihull Moors slumped 2-0 at Halifax. 📽 | The players are out! Orient will play AFC Fylde in the FA Trophy final at Wembley Stadium. Wrexham looked disjointed in midfield, disjointed in attack and conceded a goal following captain Shaun Pearson’s sloppy mistake at the back in their League clash. New signing Kemy Augustein produced moments of quality through midfield, but this was his first match since early January when he played for Barrow. It will take the former Swansea City player time to regain full match fitness and Wrexham have only six matches this season. Augustein made way for Anthony Spyrou in the second half and the teenage Norwich City striker gave Hartlepool’s back four problems. The great pity is that Wrexham’s players are giving everything they have for the team and manager Bryan Hughes, but there is a lack of fluency in their play. The Dragons have the quality in their squad to play far better than this and they are in danger of missing out on promotion again. Hartlepool attracted an attendance of 3,888 – more than 400 from Wrexham – after reducing ticket prices for the match. Wrexham would have gone top with a win at Hartlepool because leaders Leyton Orient were on FA Trophy semi-final duty, but they looked a long way short of promotion quality. The Dragons conceded after a poor defensive error, while they struggled to create chances even though they often looked the better team. Hartlepool’s Josh Hawkes scores the winner against Wrexham from a first half penalty. 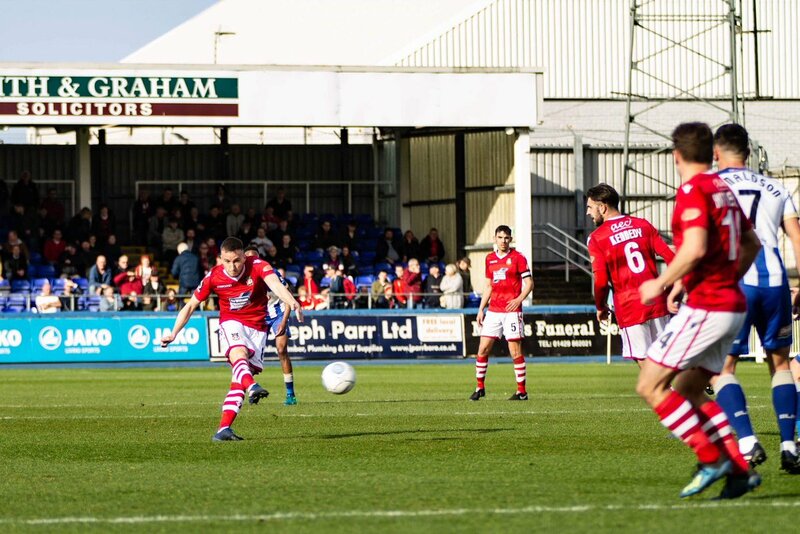 There was a lack of creativity and a nervous tension which seemed to result in Wrexham playing far too many long, straight passes aimed at Chris Holroyd. Former Brighton and Preston striker Holroyd, 32, is by no means an out-an-out target man and, while he battled gamely for possession, no chances were created. Wrexham lacked width through the opening 45 minutes and simply had to change things if they were to earn the win needed. Hartlepool’s goal was scored after 23 minutes when Dragons’ captain Shaun Pearson was dispossessed and then made a lunging challenge to concede a penalty. Josh Hawkes took the spot-kick and seemed to save a powerful shot, but the ball somehow squeezed under his body and ran over the line. Hartlepool were without David Edgar and Danny Amos, both away on international duty. Aaron Cunningham was recalled to the centre of defence after shaking off a calf strain and partnered Fraser Kerr at the back, with David Edgar away on international duty with Canada. Nicky Featherstone returned in midfield, while new signing Adam Bale was on the bench for the first time since making the move from Sunderland last week. Former Swansea City midfield player Kemy Agustein, who joined Wrexham as a free agent this week, made his debut while their second new arrival, Norwich City’s teenage striker Anthony Spyrou, was among the substitutes. Wrexham are still without Manny Smith, Brad Walker, Luke Summerfield and Mark Carrington. Hartlepool suffered on the half hour when centre-half Cunningham went off injured and Mark Kitching was sent on. Substitute Stuart Beavon went on for Jermaine McGlashan just after the hour and Wrexham stepped up their efforts to produce an equaliser. Norwich City’s Anthony Spyrou is now with Wrexham. Pic: Getty Images. The visitors went desperately close when Akil Wright’s header was cleared off the line by Nicky Featherstone and Kieron Kennedy was first to the loose ball. It looked a simple chance and Kennedy should have scored, but goalkeeper Scott Loach produced a magnificent diving save to deny Wrexham. Spyrou was sent on for Augustein, who promising a series of promising moments, and there were moments when Wrexham looked dangerous. They threw everything at Hartlepool in the later stages, throwing Pearson into attack and switching to an old-fashioned 2-3-5 formation by the final whistle. The Dragons will reflect on refereeing decisions which cut them. The officials turned down two major appeals for spot-kicks and Hartlepool were lucky to get away with both. Good work by Spyrou led to the second when he controlled the ball and crossed with pace. The ball was blocked by a Hartlepool defenders arm. Home player Liam Noble, certainly, could have been sent off after a series of fouls, but decisions went Hartlepool’s way. Wrexham will have felt even more devastated by the defeat after going back to the changing rooms and discovering title rivals Solihull Moors had lost 2-0 at Halifax. Hartlepool United: Scott Loach, Peter Kioso, Aaron Cunningham (Mark Kitching 30), Nicky Featherstone, Myles Anderson, Fraser Kerr, Liam Noble, Ryan Donaldson, Josh Hawkes (Adam Bale ), Luke Molyneux, Luke Kabamba. Subs not used: Niko Muir, Gavin Holohan, Luke James. Wrexham: Rob Lainton, James Jennings, Shaun Pearson (capt), Jermaine McGlashan (Stuart Beavon 61), Luke Young, Kieron Kennedy, Paul Rutherford, Akil Wright, Kemy Agustien (Anthony Spyrou 70), Jake Lawlor, Chris Holroyd. Subs not used: Christian Dibble (gk), Kevin Roberts, Nicky Deverdics.